Here are pictures from Rocky Mountain Vintage Racing's event in Snowmass Colorado. We had 8 BMW 02s and a TiSA. What a great time and some awesome pictures. Snowmass street race - BMW 02 battle - best race Name: Snowmass street race - BMW 02 battle - best race Category: Racing From the RMVR Aspen Snowmass Vintage Race 2018, big/mid bore group race #3, through the streets of Snowmass Village. One camera on Scott Stekr's #328 02 and one on my #202 02 with the video switching between the two for who is following. It was a great race.... enjoy. Supper awesome racing in Snowmass, still can't believe they let us do it. From the RMVR Aspen Snowmass Vintage Race 2018, big/mid bore group race #3, through the streets of Snowmass Village. One camera on Scott Stekr's #328 02 and one on my #202 02 with the video switching between the two for who is following. It was a great race.... enjoy. Supper awesome racing in Snowmass, still can't believe they let us do it. RMVR Aspen Snowmass 2018 - BMW 02 - two laps Name: RMVR Aspen Snowmass 2018 - BMW 02 - two laps Category: Racing Had great fun racing through the streets of Snowmass Village, Colorado, September 16-17, 2018. This was the second day morning warm up and we thought we would have some fun ripping through town keeping it close. Kyle Popejoy in front, me in the middle and Scott Stekr third. This was a riot. Thank you to everyone involved for making this happen, and thank you to the Town of Snowmass Village for letting us do this to their town. Had great fun racing through the streets of Snowmass Village, Colorado, September 16-17, 2018. This was the second day morning warm up and we thought we would have some fun ripping through town keeping it close. Kyle Popejoy in front, me in the middle and Scott Stekr third. This was a riot. Thank you to everyone involved for making this happen, and thank you to the Town of Snowmass Village for letting us do this to their town. you sure this is a good idea???? I know s2000 motors rev high and have good power.... but in the end... And this is a smoking deal. 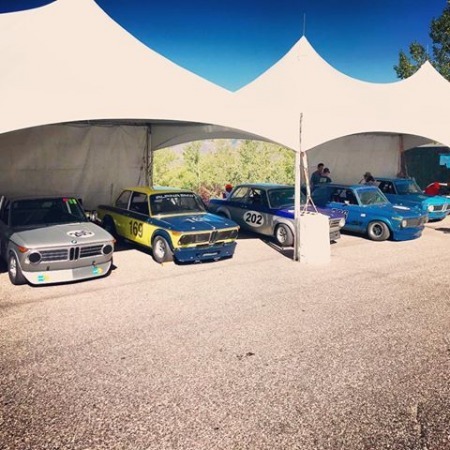 We at Rocky Mountain Vintage Racing just had its second annual Aspen Snowmass Vintage Auto Races through the streets of Snowmass Village, had 8 BMW 02s and a TiSA. Fantastic event in a fantastic place. 2 days of racing, lots of video from 7 on track sessions, this was just quick tease all from my Gopro. More to come. Aspen Snowmass RMVR 2018 BMWs tease Name: Aspen Snowmass RMVR 2018 BMWs tease Category: Racing We at Rocky Mountain Vintage Racing just had its second annual Aspen Snowmass Vintage Auto Races through the streets of Snowmass Village, had 8 BMW 02s and a TiSA. Fantastic event in a fantastic place. 2 days of racing, lots of video from 7 on track sessions, this was just quick tease all from my Gopro. More to come.